A 2012 list off applicants for Federal Aviation Administration permission to fly drones overhead shows 34 universities want to operate the spy machines. The list posted online by the Electronic Frontier Foundation also showsthat the FBI, the city of Herington, Kan., the Mesa, Colo., sheriff’s office, the U.S. Air Force and U.S. Army, and the Forest Service applied for permission. Also the U.S. Department of State, now run by John Kerry, as well as the Department of Energy, U.S. Marines and U.S. Navy also applied. But EFF spokeswoman Rebecca Jeschke told Campus Reform concerns remain about privacy. She also said schools need to let students know if they are being recorded and why. But bigger questions raised by the EFF are how many drones are in operation over the U.S., and what are they doing. In a posting this week, EFF said some reports indicate the FAA has issued 1,428 permits to fly drones over the U.S. since 2007. The EFF report said it’s really impossible to answer. “We’ve been tracking drone flights in the United States for several years now through our two Freedom of Information Act lawsuits against the Federal Aviation Administration, and we currently have more information on domestic drone flights than anyone other than the FAA. 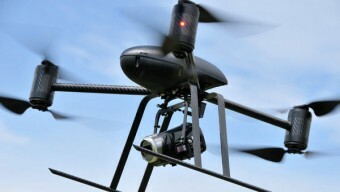 But thanks to discrepancies among various drone numbers the FAA has released – to EFF, to the Government Accountability Office and to members of Congress – it’s anyone’s guess exactly how much drone authorizations have increased over the years,” the report said. What has been made available is that in July 2010, the FAA said there were 71 experimental certificates active. Then, in April 2012, the FAA said 61 public “proponents” had applied for drone licenses. Three months later the GAO said the FAA had issued 201 Certificates of Authorization to 106 local, state and federal entities. Last September, the GAO said from Jan. 1 to July 13, the FAA “issued 342 COAs to 106 federal, state, and local government entities.” In the same month the FAA told members of Congress 228 public drone license “sponsors” had a current, expired or disapproved COA. In January, then, the FAA said 81 public drone license proponents had applied between July 2011 and October 2012. This month, the GAO reported the FAA has issued 1,428 permits since January 2007. They include disparate groups such as the Colorado Department of Transportation; El Dorado, Kan.; Minnesota’s Becker Soil & Water Conservation District; and the Texas Rangers. “Is it that the FAA, itself, doesn’t know because it hasn’t kept track of its own program?” the EFF report questioned. In just the past few weeks, the London Daily Mail reported the U.S. Air Force is developing fly-size drones that can sneak up on someone and execute him. The report said it was a project was of the Air Vehicles Directorate, a research center, that was working with Micro Air Vehicles. The Hill also recently reported that 18 states have considered plans that would restrict the use of drones because of civil liberty and private protection concerns.